A couple weeks back our aviation department got a load of Jet A fuel delivered. 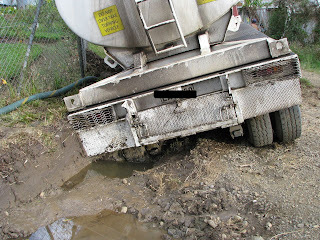 However, the driver of the truck was a little less than knowledgeable about the road. As you can see from the photos, he was stuck good in a ditch just outside of the airfield. The trailer completely sank up to the axles on this triple axle trailer. 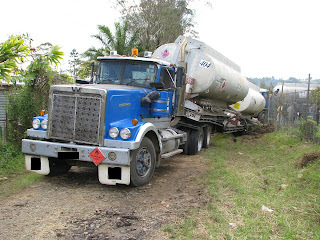 Luckily the driver had already unloaded the front tank which had the Jet A in it, but the rear tank was still full of 15,000 liters of diesel fuel. We worked on this for about 8 hours total to get him back out of the ditch. The company even had to come and offload the rear tank because we could never get it to move with it full. At the end of the day we got it out, but it sure was an adventure getting there. 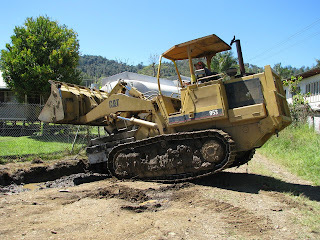 I have to give credit to the locals who helped dig out by hand some of the mud and dirt from the rear axles. There are two more axles sunk in the mud ahead of the one you see here. Lifting the trailer up with the track loader.